Are you avast! Free antivirus users? Here is your bottle of champagne. The first company I worked at was called “CPC”. Our product portfolio was excellent and the CPC acronym had some historical meaning but we all knew the real meaning was “Charts Producing Company”. We were making presentations and preparing for presentations all the time. As I said, the company portfolio was excellent so I didn’t really mind. Plus it was the first job. And, I can also say that I have learned something useful there too: If you present to any audience, it greatly helps if the audience is not sleeping. I know this is not a profound bit of wisdom, but it really works! But how do you keep them awake? After some ups and downs, I think I’ve finally got it. For last couple of years I have been using the bottle-of-French-champagne strategy: I start presentations asking a simple question. Naturally, at AVAST the question is: “anybody here using avast! free antivirus”? The reactions are always slow and shy… people hesitate to raise their hands. 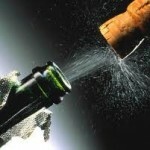 But the shyness is quickly gone when the AVAST user who was the quickest to raise the hand gets a bottle of champagne. We don’t do any paid advertising so awarding a free user every now and then with bottle of French bubbles is affordable. And it breaks the ice beautifully at presentations and keeps the audience ready for any other question. And an alive audience is the best thing one could wish for. Today I made a presentation for 110 MBA students and faculty from Florida University. They are visiting Prague and seeing interesting companies like Skoda Auto, Foxconn and others. Judging from the number of questions, the students enjoyed it as much as I did. A number of good questions and some really smart ones. It was a really good time.